Ever since Chelsea was a little little girl, I’ve asked my kids what kind of special cake (or cupcakes) they’d like for their birthdays. And I’ve done it all – from Pokemon to Hello Kitty, Power Puff Girls to Scooby Doo, Arthur to Winnie the Pooh. I’ve done college mascots, bugs and Ninjagos. And there was one year when Conor “designed” his cake – presenting me with a drawing of his idea, which I re-created in icing. 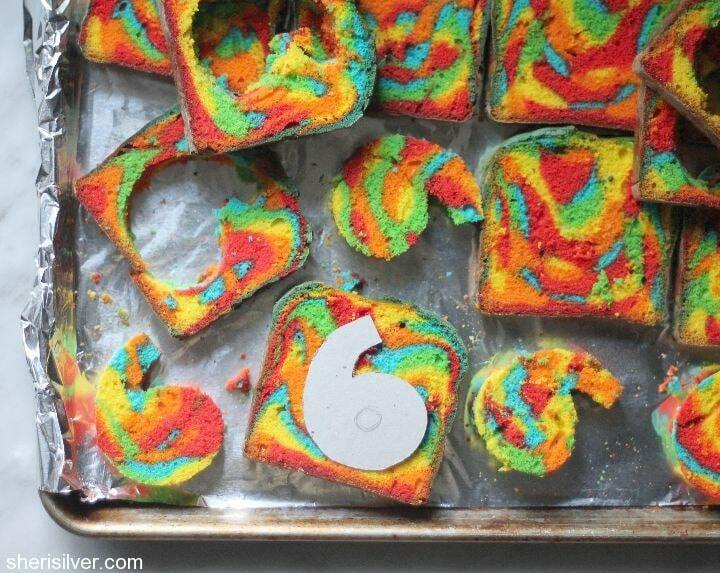 For his 6th birthday Noah simply said, “Rainbow”. 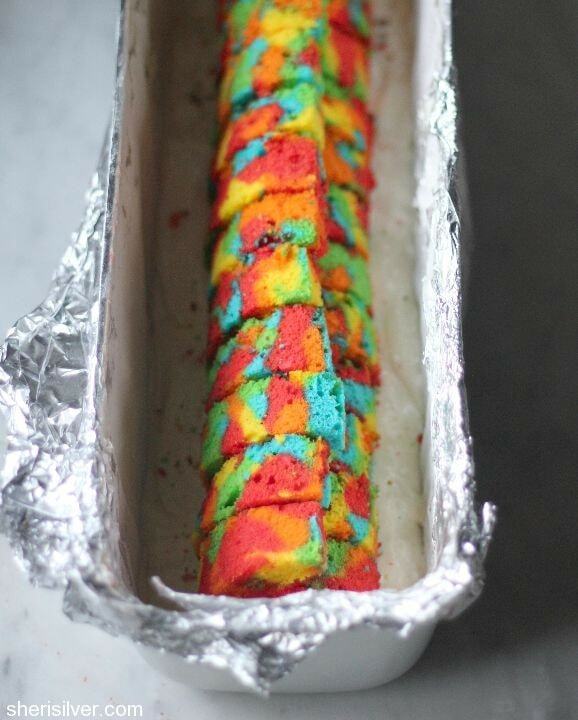 A white cake with a picture of a rainbow. A multi-layer cake, each layer being a different color of the rainbow. 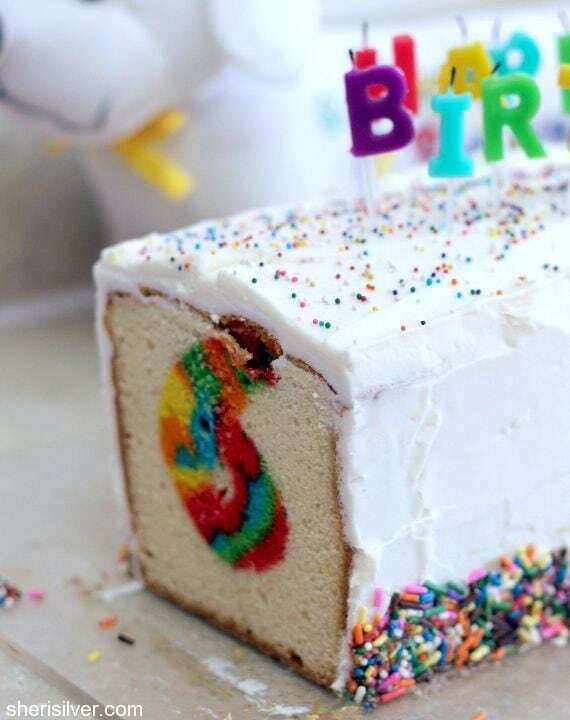 And then a Pinterest search led me to a photo of a plain white cake that – when sliced – revealed a hidden rainbow number. I immediately clicked over and was “surprised” (sorry) to see how ingenious – yet easy – the execution was. Yes, there were several steps. And yes, it would take some time. But none of the steps were difficult, and if I could pull this off? Wow. And while the cake did not come out perfectly (I’ll explain what I’d do differently next time, below), I was thrilled with the results. I’m going to take you step-by-step through the process, so that you’ll have even greater success. Pre-heat oven to 325. Line a 16 x 4 x 4.5 loaf pan with aluminum foil – grease and flour the foil. Make TWO batches of the cake mix, doubling the ingredients according to the package. 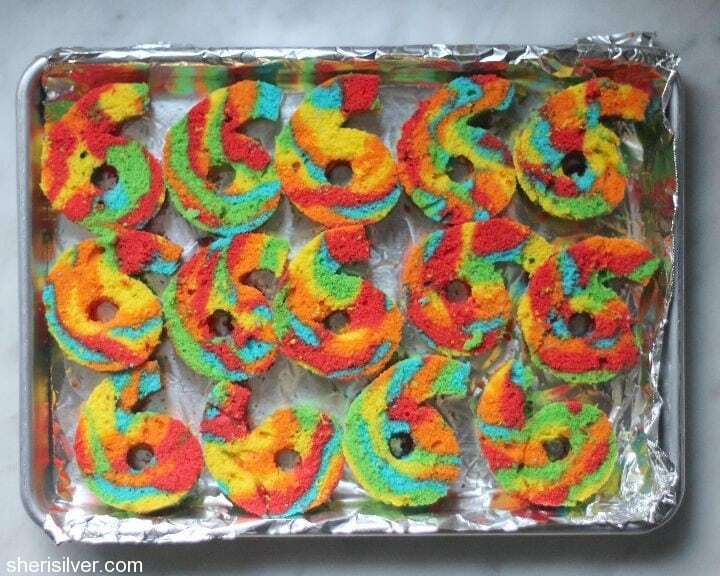 Divide the batter evenly into five bowls – tint the batter red, orange, yellow, green and blue. Transfer the batter into disposable pastry bags or zip loc bags. 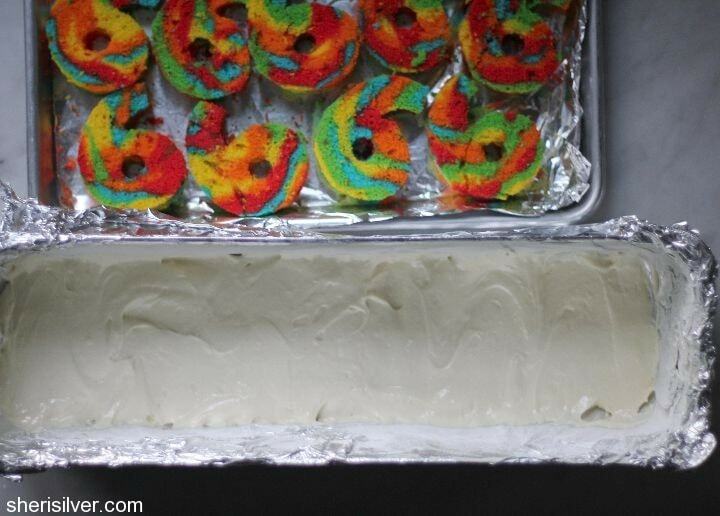 Alternating colors, drizzle the batter into your prepared pan. Tap the pan on the counter a few times to remove any air bubbles. Bake for 70-80 minutes, or till a toothpick inserted in the center comes out clean. 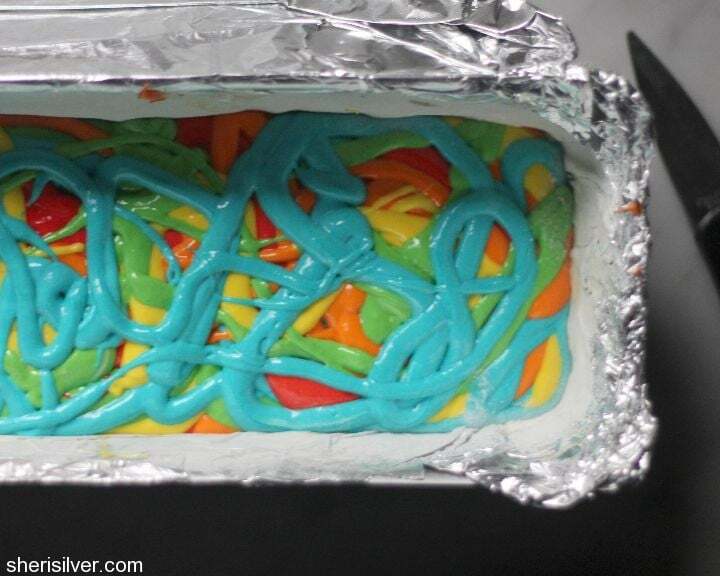 Cool cake in pan for 20 minutes – remove from pan and cool completely on a wire rack. 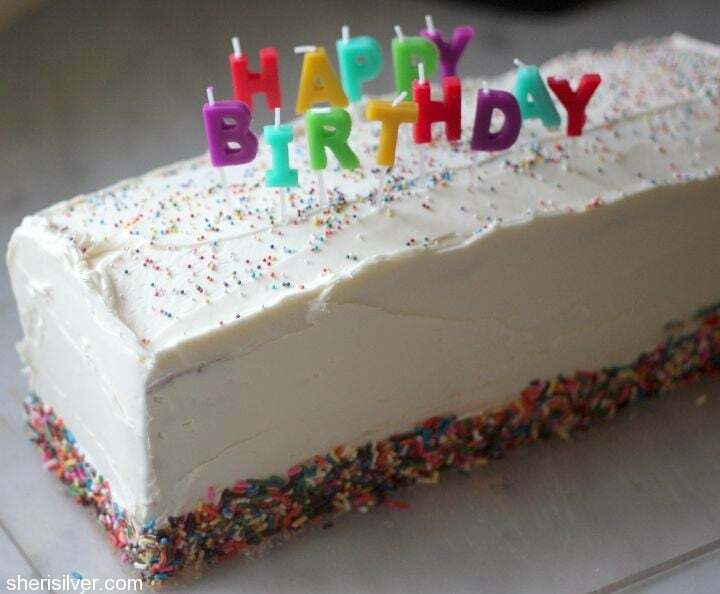 Cut the cake into 1″ thick slices – lay slices on a baking sheet and freeze for at least one hour. Using a stencil (either bought or homemade), cut your shapes out of the slices (you can freeze the scraps for snacking). Place the shapes back in the freezer. Clean your pan and line/grease/flour again. Make the remaining two batches of cake batter – transfer to a large pastry or gallon zip loc bag. Pipe a very thin layer of batter into the bottom of the pan. Line your numbers upright down the center of the pan; pipe batter around to keep them straight and standing. Pipe remaining batter around and on top of your numbers – and be sure to mark which side is “forward”, so that you slice the cake in the right direction. Smooth the top of the batter. Bake for 70-90 minutes, or till a cake inserted into the center comes out clean. Cool cake in pan for 20 minutes – remove from pan and cool completely on a wire rack. Use your buttercream to cover the cake on all sides (again, be sure to mark which side is facing forward). Decorate as desired. Feel free to use whatever rectangular shaped loaf pan you own – the pan I used here was perfect for serving a crowd, but a standard size would be fine too. I highly recommend using gel or paste food colors, versus the liquid bottles you get at the grocery store. The colors will be much more vibrant and the batter will not be diluted (a problem with liquid food colors). 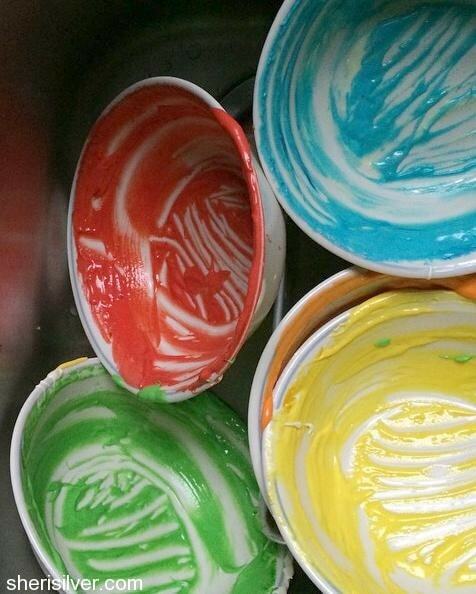 When you take your rainbow cake out of the oven, the outside colors will look dulled and a bit muddy – don’t freak out! 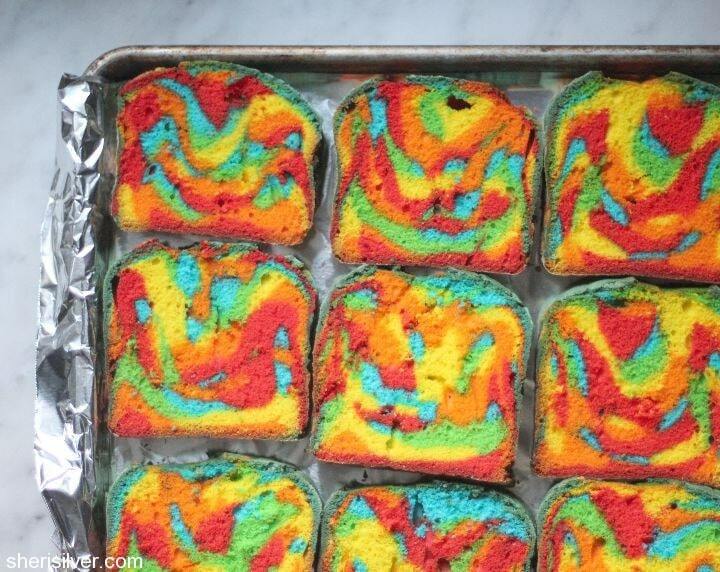 Once you slice into it you’ll have the same bright and vivid colors you see here. It’s important to use pound cake (either your own or from a mix), as opposed to traditional cake batter, as the density of the pound cake will keep the numbers (or shapes) from floating to the top. As you can see from the picture, my bottom layer of batter was too thick. In addition to the numbers not being perfectly centered (GRRRR), I couldn’t level the top of the cake after baking, lest I cut the tops of the numbers off. A REALLY thin layer is all you need. You can use any cookie cutter or – as I did – make your own stencil (many thanks here to my pal Sara, who was my official “counsel” for this project – and many others). Can I make a “2” cake for my fave almost-2-year-old???? Thank you SO much – and just took a look at your blog – it is beautiful and I’m sharing it with my vegan daughter right now!